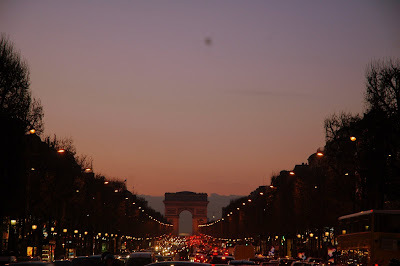 Avenue Des Champs Elysees after the sunset. I now know why Paris is called the " City of lights". This evening stroll at one of the most expensive avenues in the world, is a "must do" for any tourist. We all love celebrity gazing. In a rare interview in the WSJ, Bill Gates Sr reveals the " behind the door" secrets of the Gates' household and insights into Bill's childhood. a) Bill's rebellious nature ever since he was a Child and how the parents dealt with it. b) How his interest in Philanthropy started. 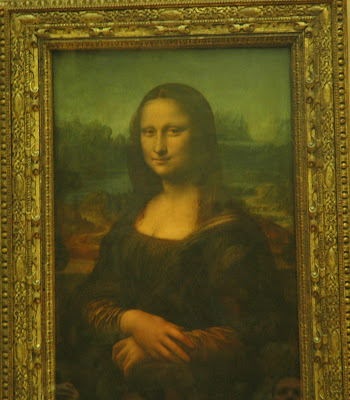 The Italians call it " La Gioconda", the French call it " La Joconde" and we all call it the " Mona Lisa". At the Louvre museum, all roads lead to Mona Lisa. This famous painting , by the genius Leonardo Da Vinci, was surprisingly small in size compared to most other paintings in the Italian section. The painting's current value is estimated to be in excess of $0.5 Billion. I started the Louvre tour at the Mona Lisa and was lucky because the crowd was quite less in the afternoon. Here are some more photos from the Paris trip. A cultural tour of Paris - Cathedrals, Gardens, Cemeteries, Little India ( Rue Fraubourg) , Museums and Artiste Village. I happened to watch the yesteryear classic " The Gods Must Be Crazy" yesterday. It was an absolutely funny, earthy and timeless movie whose message remains relevant even today. The movie revolves around three distinct stories - A Kalahari bushman who finds a coke bottle and how it changes his life, A goofy scientist who gets nervous in front of women and an african civil war rebel. The director weaves these stories deftly together with dollops of humor and earthiness. The greatest success of the movie in my opinion is it makes you wonder about the relevance of " Civilized world" without ever being preachy. Grab a DVD if you can. I seem to enjoy the private concerts much better - they are thematic, focused, small group of listeners, no microphones and with ease of interactivity with the Singer ( not to forget the delicious food that is served !). 5. Rama Daya - Thodi - ?? 10. Thava nama - Kaanada - ?? 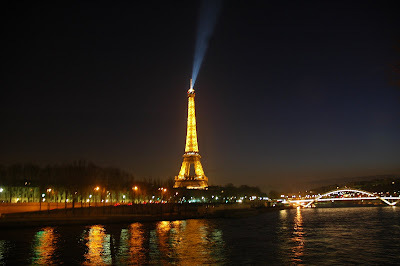 Took this photo after Sunset from across the Seine river. I just saw this movie. It is too late to write a review since it is a movie that has widely been reviewed by press and bloggers. I haven't seen a movie in a long time that has captured splendidly the pent up frustrations of the common man with a taut screenplay / top-notch acting. There are plenty of movies that have either done the former or the latter but rarely both. Salute to Naseer and Anupam Kher - that was one heck of acting. It was quite heartening to read the progress made by the Mushahar community in Bihar. The community name which loosely translates to " rat eaters" has made social progress in the last few years due to the literacy drive by the Bihar Government. With the Government now announcing "rat farming" - promoting rat as an edible food, the community fears that this would turn the students from the classroom to the fields again. There is still a lot of hunger in rural India but these days it is turning into hunger for growth and development or as the protesters aptly summed it up " We want to learn to use a computer mouse, not catch mice." Photos taken during the trip to the Louvre Museum in Paris. Louvre is one of the largest and famous museums in the world and could be daunting for visitors due to its sheer size. If you were to spend 10 minutes looking at each artifact, it would take you months to see the museum completely. I spent more than six hours at Louvre - got " lost" many times and also lost 3 kgs in the process ! The audio guide ( English) was very helpful in understanding the history and significance of most well known artifacts there. Due to the limited time that I had, I did a very " touristy" short trip but got to see some of the most famous artifacts - Monalisa, Code of Hammurabi, Nike statue, Venus De Milo, Seated scribe, Dying slave, Madonna and Child. NDTV has ran a poll to select the " Seven wonders of India". The winners are an eclectic mix : Sun temple, Khajuraho, Jaisalmer fort, Red fort, Nalanda university, Dholavira site, and Meenakshi temple. The Taj ( wonder of wonders) , Golden temple (peace) and Tawang monastery( spiritual) are in the " special" category. Having been to 6 / 10 places, the two places I am dying to see in this list are Nalanda University ( Planned a trip in 2004 but had to cancel it due to my grandfather's health condition) and Tawang monastery. Here are the first set of Photos from my Paris trip - Arc De Triomphe , Avenue Des Champs Elysees and Eiffel Tower. Hats off to Meera Sanyal for taking the bold step. The country head of ABN Amro has decided to contest the elections as an Independent from South Mumbai constituency. She is very well known for her active involvement in community service besides her corporate career. I wish her the very best !